What would you think, when crossing a Himalayan glacier, if you found this footprint? Clearly some animal made the mark. This print is in a longer line of tracks, and shows not just one animal. The print looks like a person’s … but that gigantic toe on what is a left foot has the arch on the outside of the foot. Big toe on one side, the arch on the other, three tiny toes? And the longer line of footprints suggests that a family of mysteries walked the route. 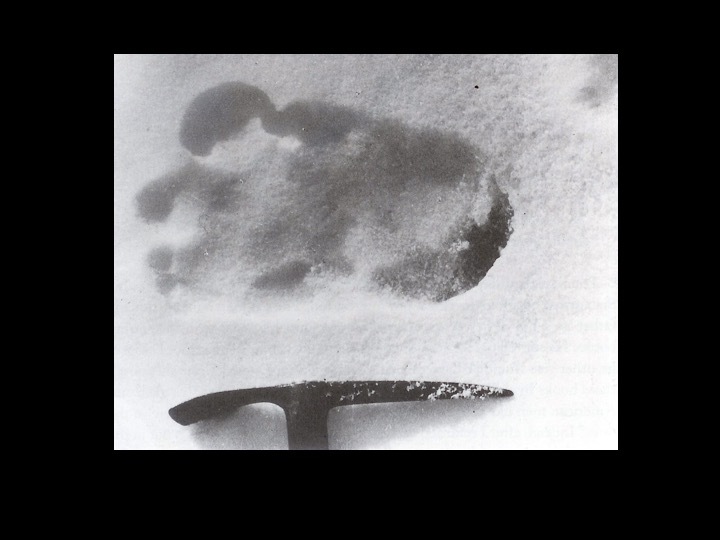 Moreover, the ice-axe shows the footprint is 13 inches long. Did a family of giants walk this way? Sharp footprints on a glacier where no village or caravan route is within days of walking, found by a reputable explorer (Eric Shipton). In 1951, when these footprints were found, they gave proof to the long-standing puzzle of the Yeti or Abominable Snowman. Yak Caravan by Daniel C. Taylor, used with permission by author. As an eleven-year old, I also found these photographs. Our home was in the Himalaya, and I began searching the mountains. For three decades, I, along with others, kept discovering footprints. Frequently, discoveries were in the region around Mount Everest. We repeatedly found prints in differing sizes over what came to span a century. From this grew a body of evidence that has been subjected to scientific scrutiny, time and again. These prints are not a hoax, but trails left by real animals. Is the animal a primate like a gorilla yet to be discovered? Or, some relative of the giant panda? With the astonishing human-like feet, is the animal a relic of some prehistoric human population? Does a known animal make such footprints when in the snow? The footprints are being found at high-altitudes, where the oxygen is one-third that of sea level. The challenge for me (and all of us who were searching) was that the trails always disappeared onto rock at the edge of glaciers. Our discoveries were always at best several hours behind the print making. We never found an animal making these trails. The mystery marched on across decades. Then in the densest jungle in the Himalaya—the Barun Valley east of Mount Everest—when searching in the winter when snow was on the ground, we found footprints, and these footprints could be followed. They led not onto rocks, but up trees. Up in the trees we found huge nests where the animal slept. In the nests we found stiff black hairs, and the hairs could be identified: bear. We acquired skulls of this bear, and it was indeed Ursus actos thibetanus. Museum study then revealed that in the 1800s there were reports of tree-living bears in the Himalaya. Might a remnant population of these never further reported bears survive in the remote Barun Valley? 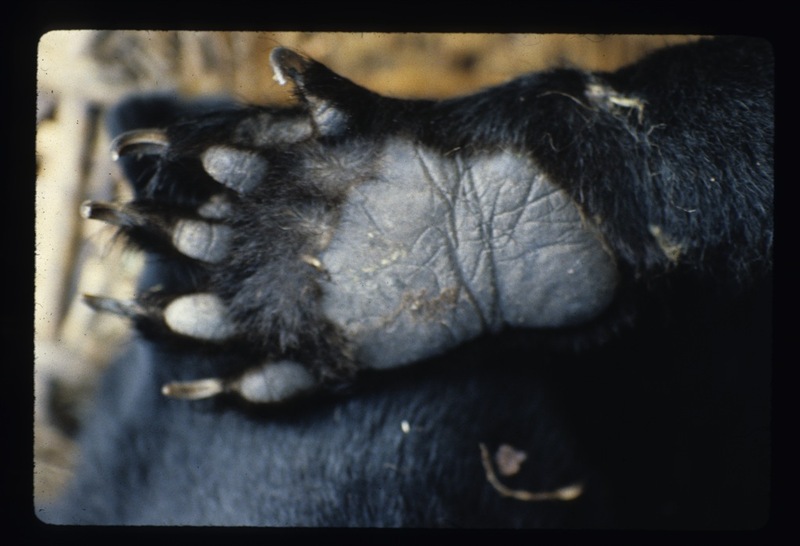 Bear foot by Daniel C. Taylor, used with permission by author. Figuring out this bear quest, however, led to a larger, more important trail: the creation of national parks to protect the jungle and mountains habitats the bears resided in. We first established Makalu-Barun National Park in Nepal, then came Qomolangma (Mt Everest) National Nature Preserve in Tibet/China. 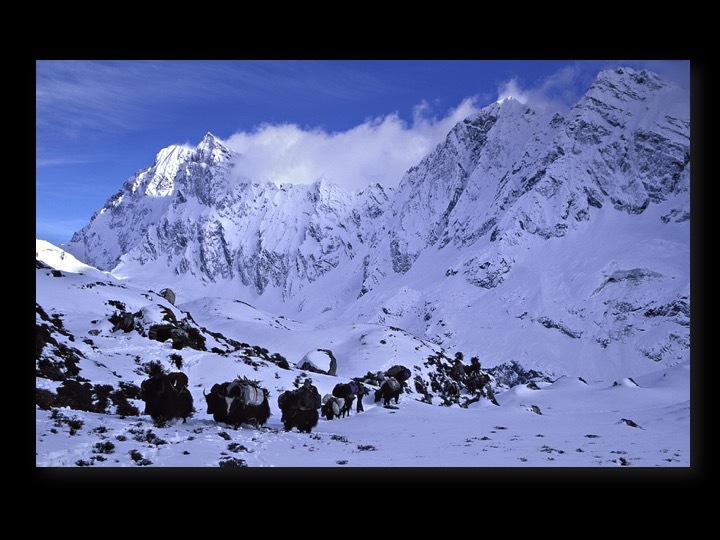 Then in the 1980s, still pristine were the valleys around Mount Everest. What followed then across Tibet was a series of huge national parks and setting aside what has now grown to over one hundred million acres of protected land. This conservation effort was also distinctive because it evolved a new mode of nature protection, one that enabled people to live inside the parks, where community-based governance (not park wardens and police) protected the land. All this started from the Yeti search. 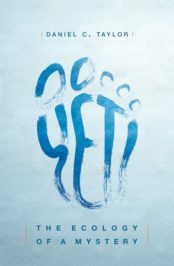 Perhaps most interesting about discovering the Yeti is that after a century of scientific work explaining the footprints, there’s still something missing. Yes, now we know what animal makes the footprints—the bear goes over the mountain to see what it can see or to mate—but there is another mystery. A core search seems to lie in our human connection, affiliation, to understand the wild. We seek a missing link to where our species evolved from. With so few jungles left, is the wild gone now? Inside ourselves we want the wilderness to remain. A wild “man” of the jungle, the Yeti, remarkably can lead us to discovering a new type of wild that each of us can live in today. Featured image credit: Expedition in high snows by Daniel C. Taylor, used with author permission. Daniel C. Taylor, author of Yeti: The Ecology of a Mystery, has been engaged in social change and conservation for four decades with a focus on building international cooperation to achieve ambitious projects. He founded the nine Future Generations organizations worldwide (including the accredited Future Generations Graduate School). He also founded and led The Mountain Institute and its worldwide programmes. In 1985, after providing the scientific explanation for the yeti, he led creating Nepal's Makalu-Barun National Park, then, in close partnership with the Tibet Autonomous Region, China's Qomolangma (Everest) National Nature Preserve and Four Great Rivers Nature Preserve protecting one-seventh of China's forest reserves. Taylor is also one of the synthesizers of the SEED-SCALE method, an understanding of social change initiated by a UNICEF task force he co-chaired from 1992 to 1995.